Every Latin American country has its own version of the empanada, the flavorful turnover that makes an ideal snack or a starter for a more elaborate meal. The Argentine default version features flaky phyllo dough that’s usually filled with ground beef, hard-boiled eggs and olive, but the best will come with chopped rather ground beef. That said, there is a great diversity of fillings, such as ham and cheese, chicken, cheese and onion, and even vegetarian versions – the ones in the photograph above, prepared by my wife, are filled with Swiss chard. 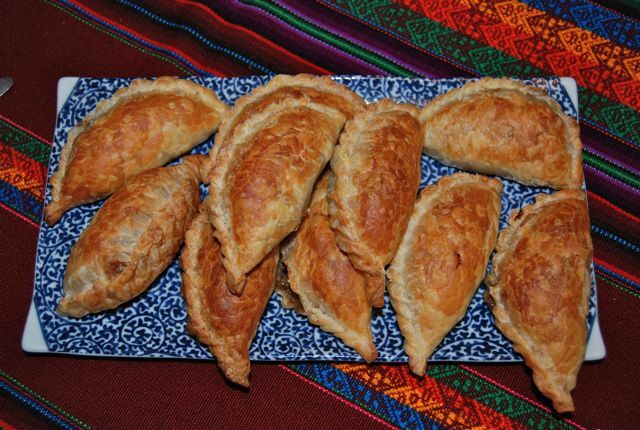 The spicier ground beef salteña comes from northwestern Argentina, but is available in Buenos Aires; the tangy empanada árabe (lamb with a touch of lemon juice) is common in the western provinces of San Juan and La Rioja. Empanadas al horno (baked) are lighter than fritas (fried, sometimes with heavy oil). 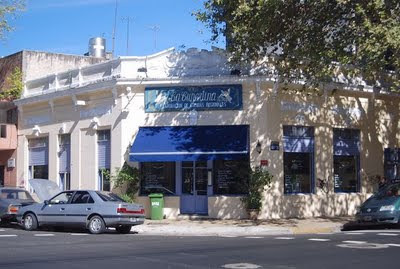 Probably the best all-around choice that remains is Recoleta’s El Sanjuanino, just a couple blocks from the Cementerio de la Recoleta and the iconic Alvear Palace Hotel; it also has a wider menu of regional Argentine food. Whenever I’m walking around town, I won’t hesitate to stop at La Continental, a chain pizzeria that prepares a wide selection of empanadas. If I’m in the right neighborhood, I’ll visit San Telmo’s La Carretería or Belgrano’s 1810 Cocina Regional. All that said, it’s hard to go wrong with Argentine empanadas. 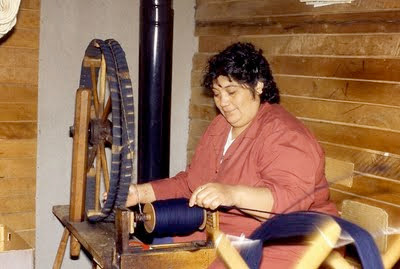 Personally, I prefer the Argentine version to their Chilean counterparts. In general, Chilean empanadas are far larger, the dough is nearly as heavy as bread, and they are more often fried than baked. Chile also offers less variety – the standard empanada de pino consists of ground beef with hard-boiled egg and an olive and, to be fair, its size makes it a meal in itself. That said, there are alternatives – in Santiago’s Barrio Brasil, Peperone serves a greater diversity of fillings, including items such as ostiones (scallops) or even locos (abalone) that are almost impossible to find elsewhere. At first glance this might seem off-topic to a post on Buenos Aires but, last Saturday night, my wife and I went to see Los Straitjackets at the Great American Music Hall in San Francisco. After all, the Straitjackets are a Nashville-based instrumental surf music band whose members all wear Mexican lucha libre wrestling masks on stage. While they sometimes play with guest vocalists, they almost never sing, and only speak to introduce their songs in broken Spanish. 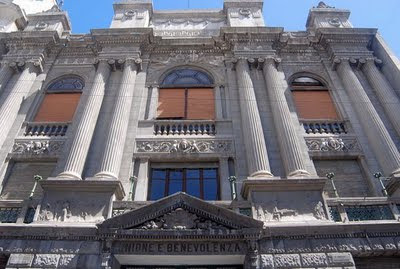 All that said, there is a Buenos Aires connection here – a few years ago, in the basement of the downtown Club Unione e Benevolenza (the Italian Benevolent Union, pictured above), I saw the Straitjackets’ lead guitarist Danny Amis – also known as Daddy O Grande – on the same stage with the local surf bands Los Kahunas and The Tormentos. Yes, you read right – however improbable it might seem, there is a surf music scene in the birthplace of the tango. For the finale performance of “Pipeline,” not another musician could have fit on stage. What’s more, surf music and tango are not incompatible, at least to judge from the work of Daddy O Grande and The Tormentos. 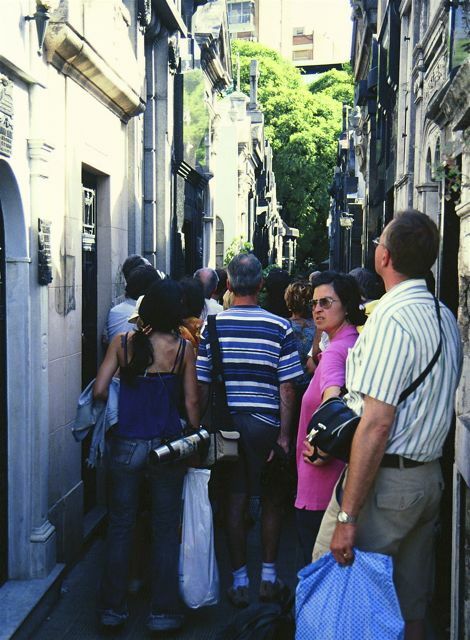 In 2009, they performed “La Cumparsita” – possibly the most famous of all tangos, composed by the Uruguayan Gerardo Matos Rodríguez – on stage in Buenos Aires. 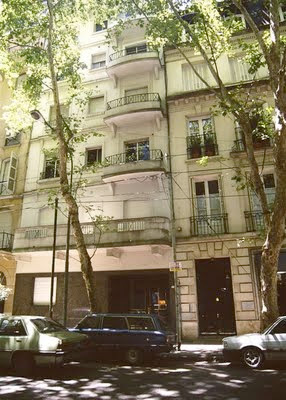 The venue appears to be Palermo’s Niceto Club. Unfortunately, Daddy O Grande did not appear with the Straitjackets last Saturday, as he is under treatment for multiple myeloma. The group’s tour continues in the Pacific Northwest and tonight, August 24, there will be a benefit concert for him in Boston. At none of these events, unfortunately, are you likely to hear “La Cumparsita.” Those of you in Buenos Aires may well hear it at Festival y Mundial de Tango, the tango festival and dance championship that continues through August 30 - but without that distinctive surf guitar. 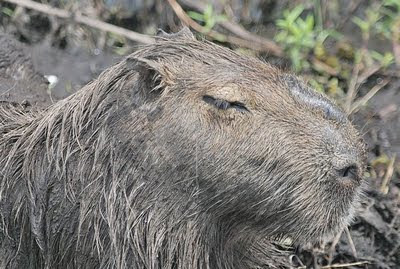 I first saw a capybara, a rodent roughly the size of a Rottweiler, on a 1976 boat trip down the Río Napo, an Amazon tributary in the Oriente region of Ecuador. 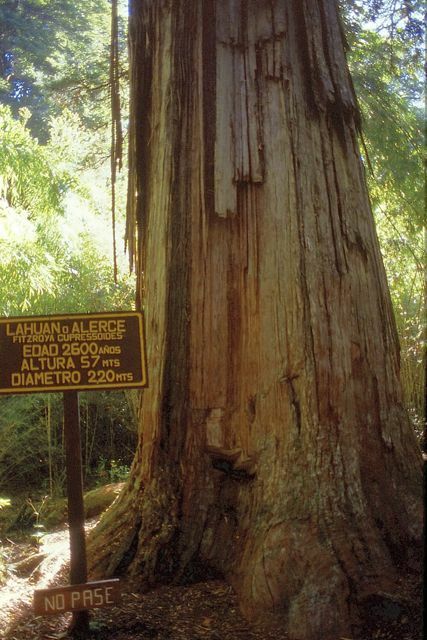 Along with several other gringos, I was a passenger on a motorized dugout from Misahuallí to the then remote oil camp of Coca, through a lush, humid tropical rainforest environment. One of the most exciting things we saw was an enormous capybara dog-paddling from the river’s southern shore toward the north. We grew even more excited, or rather alarmed, when the dugout's crew turned sharply and began to club the animal with their oars (on board in case the motor failed). For the passengers, most of us Europeans, the capybara was an exotic animal whose sighting was something unique in our lives; for them, living in the rainforest, it was dinner. 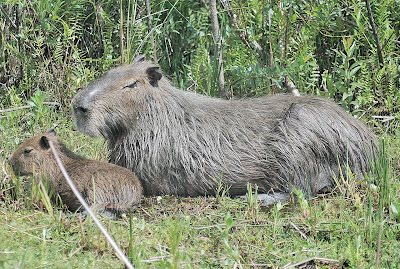 Since then, I’ve seen hundreds if not more capybaras, most notably in Argentina’s Esteros del Iberá wetlands, where they tamely graze the lawns at Estancia Rincón del Socorro and the visitors center at the provincial reserve. I’ve never even seen them in a zoo elsewhere, so I was surprised to read that, according to the San Luis Obispo Tribune, a carpincho (to use the Spanish word) has been sighted in the California town of Paso Robles. 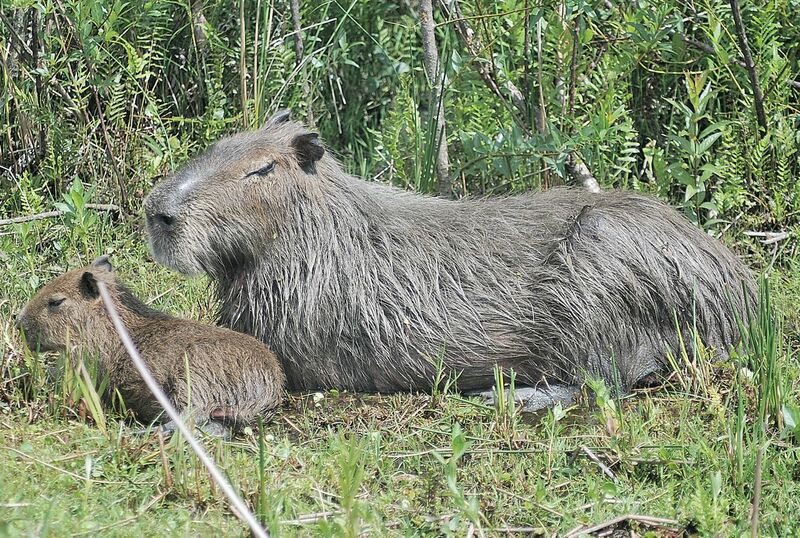 It’s believed to be an escaped pet, though it’s not legal to keep capybaras in California. Apparently that’s alarmed some people, but it shouldn’t. Despite its size, the capybara is an innocuous herbivore that keeps a respectful distance from human beings – as you might if a riverboat crew ever thought of clubbing you on the head. 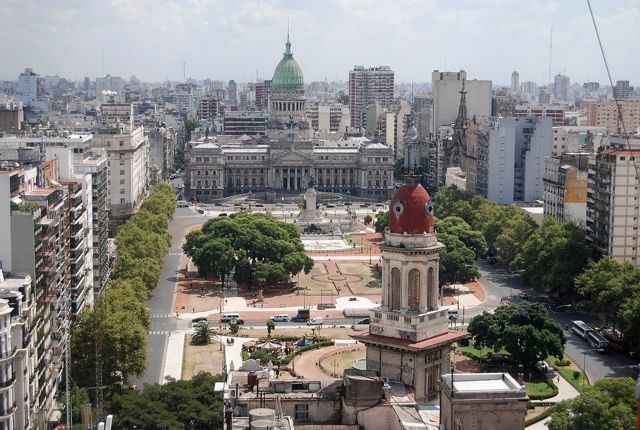 It’s worth mentioning that, in Argentina, they are bred in captivity, with their spotted leather highly prized for clothing and coverings for souvenir items such as mate gourds. While traveling to southern Chile, I have always spent an overnight at the gracious German guesthouse El Rincón, just north of the city of Los Ángeles (about 500 km south of Santiago, close to Parque Nacional Laguna del Laja, pictured above). Last month, though, its host Winfried Lohmar died suddenly and his widow Elke has decided to sell the property. It’s a lovely house, on wooded grounds with extensive vegetable gardens, and suitable to continue as accommodations or for another purpose. 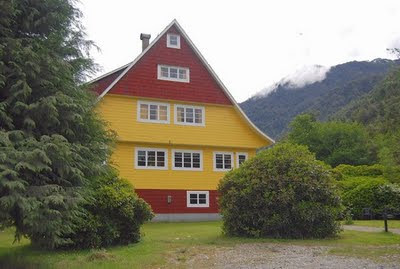 The price is 150,000,000 Chilean pesos, about US$320,000 at the current exchange rate. For more details, contact Elke Lohmar’s daughter Silke (slohmar_2000@yahoo.com). 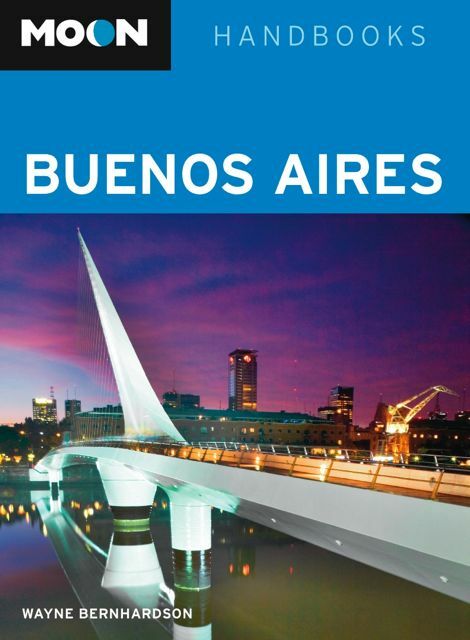 Tomorrow, August 20, will mark the second of several digital slide presentations on the fourth edition of Moon Handbooks Buenos Aires, at various branches of the San Mateo County Library. The Saturday event starts at 2 p.m. at the Atherton Library (2 Dinkelspiel Station Lane, Atherton, CA 94027, tel. 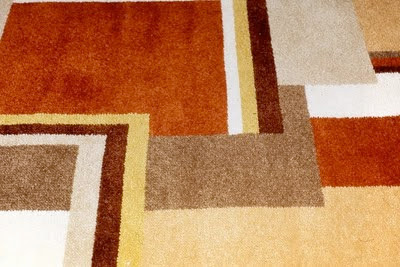 650/328-2422). There will be ample time for questions and answers, and books will be on sale. As I mentioned earlier this week the town of Atherton, one of the Bay Area’s wealthiest communities, has strong South American connections – Massachusetts-born Faxon Atherton, for whom the city is named, spent 27 years as a merchant in the Chilean port of Valparaíso, married a Chilean woman who gave him seven children, and lived in California from 1860 until his death in 1877. He also owned large tracts of present-day Hayward and Watsonville. By this standard, the median price of roughly US$250,000 could conceivably purchase an apartment overlooking the cemetery, but you would enjoy that only as long as you lived. 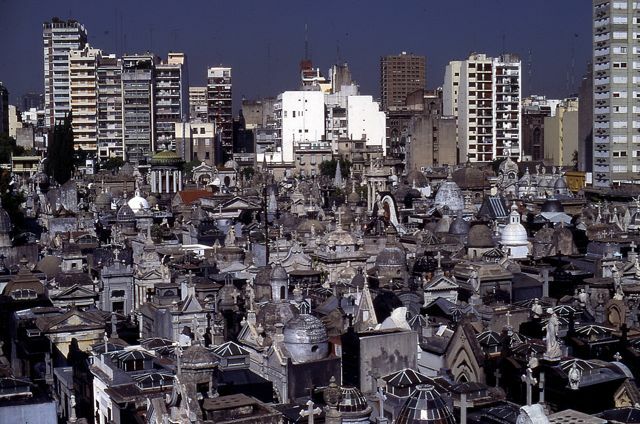 On the other hand, if you invest the same amount of money in the cemetery itself, you could find yourself spending eternity alongside…Eva Perón! 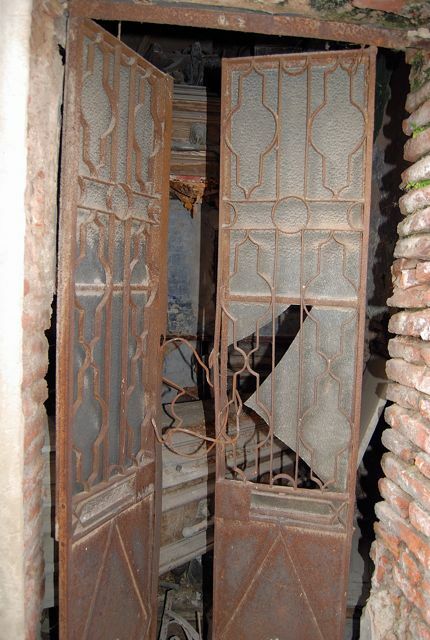 On the crypt next to Evita’s, the owner has placed a small “for sale” sign with his email address (dsabelli@hotmail.com) and, according to Clarín, he’s received about 20 to 30 messages since putting it on the market in January. 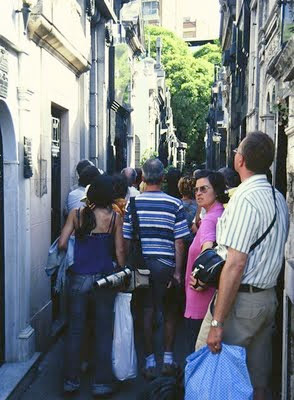 Given that Evita’s tomb is the most visited in all of the Recoleta, anyone interred next door will at least get a few curiosity seekers awaiting their turn to see the former first lady’s final resting place, as in the photo above (these are not potential buyers lined up for the open house). 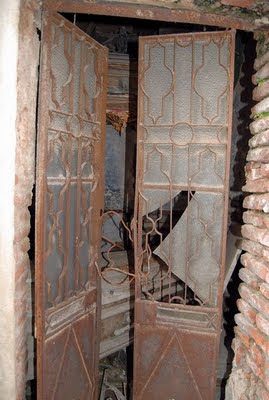 On the other hand, those who need more immediate gratification might consider looking to buy her apartment at Posadas 1567 (pictured below), less than five blocks from the cemetery gates. This coming Saturday, August 13, will mark the first of several digital slide presentations on Moon Handbooks Buenos Aires, at various branches of the San Mateo County Library. This week’s event starts at 2 p.m. at the San Carlos Library (610 Elm Street, San Carlos, CA 94070, tel. 650/591-0341). There will be ample time for questions and answers. Today's entry touches on Argentina's Iguazú falls, Chile's remote Aisén region, and an important exhibition on the Chilean mine rescue of 2010. In the indigenous Guaraní language, Iguazú means “big water” and, for anyone bound for Parque Nacional Iguazú and its magnificent Cataratas in this southern winter, that means good news and bad news. First the good news: temperatures are mild (upwards of 70° F for the next several days) and the falls are even more spectacular than usual. That’s because, thanks to heavy rainfall in the Río Iguazú’s upper drainage in Brazil, the falls are carrying 13,000 cubic meters of water per second, about eight times their normal flow of 1,500. 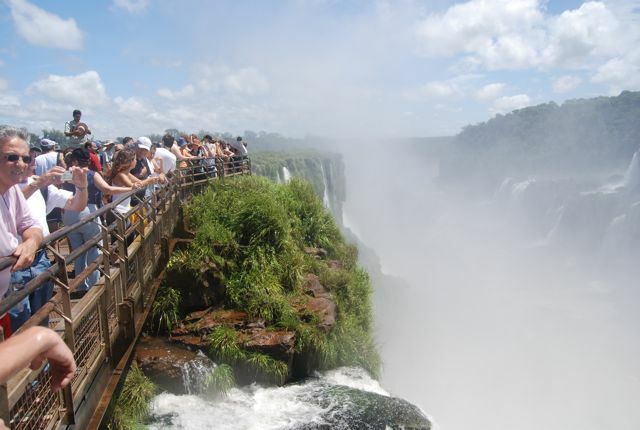 The bad news is that the flow is so heavy that national park authorities have had to close the observation deck opposite the Garganta del Diablo, the single most impressive of the nearly 300 separate falls. 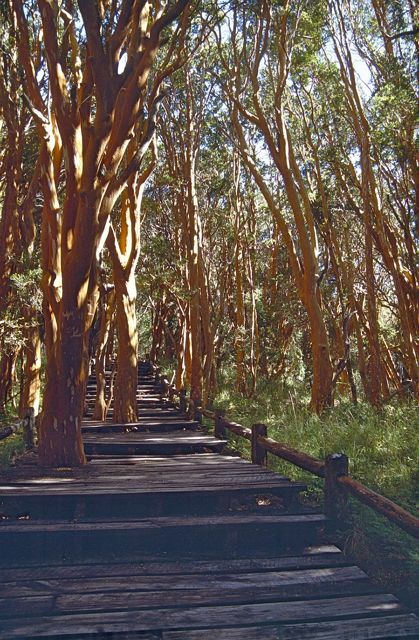 Even with normal runoff, the deck (pictured above) gets plenty of spray from the falls, so that visitors sometimes wear rain gear on bright sunny days. 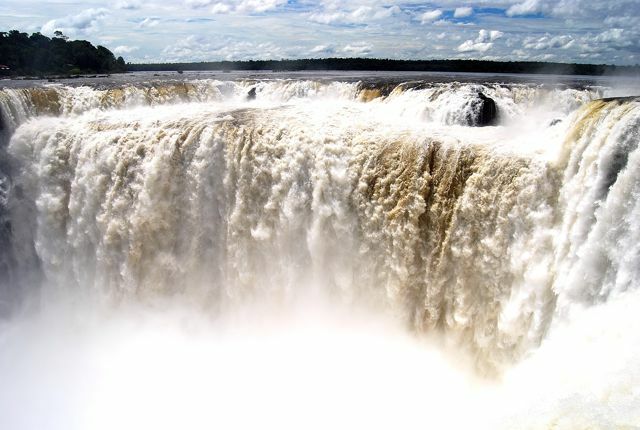 At present, though, the increased flow makes it dangerous and slippery (nobody wants to go over the Garganta del Diablo, in a barrel or otherwise). 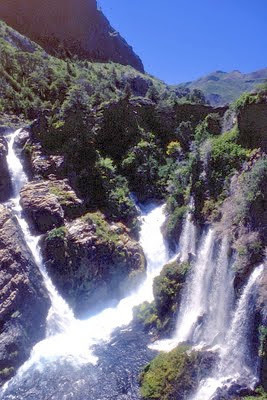 At the same time, the excursion boats that approach the falls from below have also been suspended. With the storms ending in Brazil, Iguazú should return to normal in a few days at most. Much farther south, the town of Puerto Puyuhuapi, where Luisa Ludwig lives, is part of dankest Patagonia – winter gets wet and cool on the Chilean side of the Andes. August rainfall averages 401 mm (about 16 inches), but there’s a ray of sun this month - her Casa Ludwig B&B (pictured above) is the first private building to be designated a national historical monument in Chile’s southern Aisén region. For those of you fortunate enough to live in Washington DC – despite the manufactured political crisis of the past several weeks, there are good things about DC, where I once spent a semester teaching at George Washington University – there’s something worth seeing starting today. 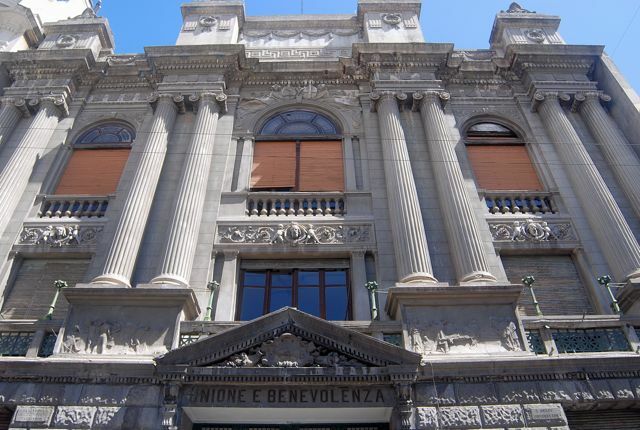 With sponsorship by the Chilean embassy, the Smithsonian Institution’s Natural History Museum will host the exhibition “Against All Odds: Rescue at the Chilean Mine” as the first anniversary of the successful evacuation of the collapsed San José mine near Copiapó approaches. The Chileans, at least, can get things done; among the objects on display will be the actual rescue capsule that brought the miners to the surface (claustrophobics may want to stay away). Recently I wrote about the Southern Cone winter, stressing skiing in Argentina and Chile, but the Patagonian coast is also a worthwhile winter destination – in Argentina, at least. 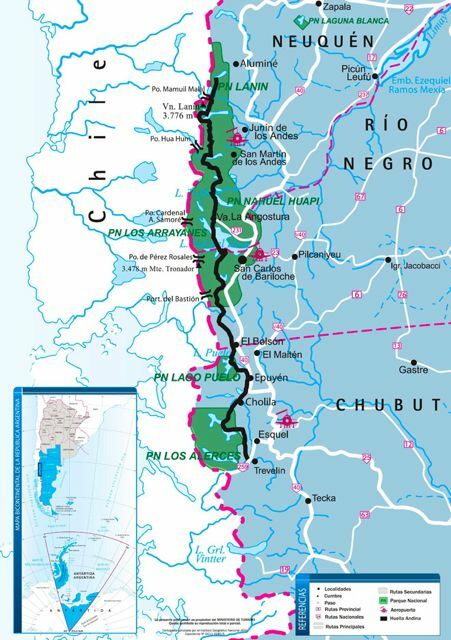 Except in the desert north, where upwelling from the Humboldt Current keeps the waters cool all year, the Chilean coastline tends to be wet and inhospitable in winter. 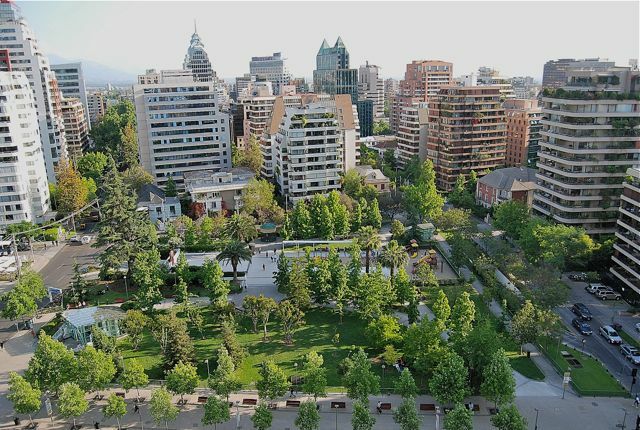 On the Argentine side the climate can be cool but, by contrast, the air is dry and the famous Patagonian winds tend to abate at this time of year. 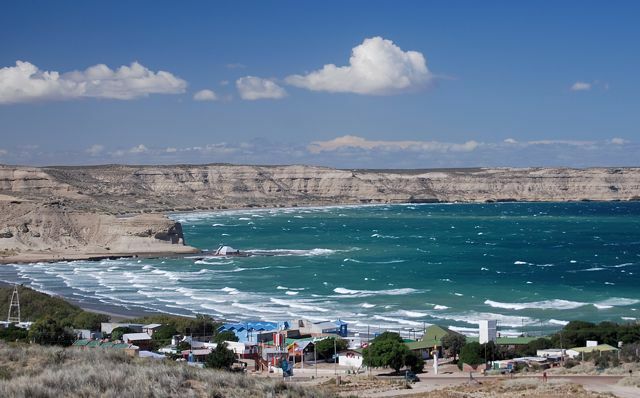 That’s partly why coastal Chubut province, in particular, has become a popular destination for Argentine winter holidays. 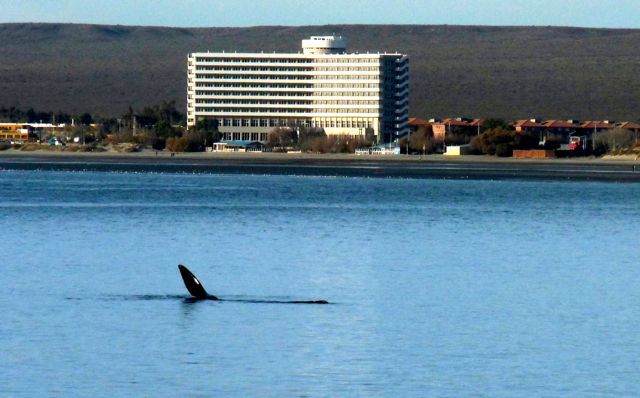 Primarily, though, it’s the abundance of wildlife on nearby Península Valdés that gives the city of Puerto Madryn (pictured at top, courtesy of María Alicia Sacks) a longer tourist season than most of the region. The village of Puerto Pirámides (pictured above and below), which is actually on the peninsula, is more convenient for watching the southern right whales that frolic along the eastern shore of the Golfo Nuevo, but its accommodations and other services are fewer than the larger city’s. 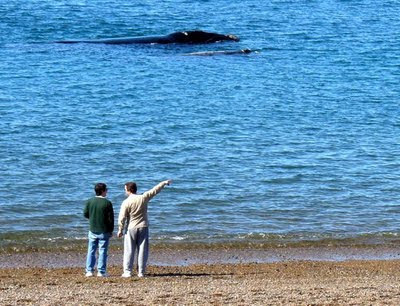 Consequently, most visitors to the region stay at Madryn and visit Valdés as a day trip – although, in fact, whales also breach beneath the headlands at Playa El Doradillo (pictured below, courtesy of María Alicia Sacks), only 15 minutes from downtown. This year, though, the June eruption of Chile’s Volcán Puyehue has reduced air travel to the city, which is 1,300 km south of Buenos Aires, making long-distance buses the preferred option. That’s a 20-hour marathon from the capital, but services range from merely comfortable to fully reclining seats that provide nearly as much space as business class on international flights. 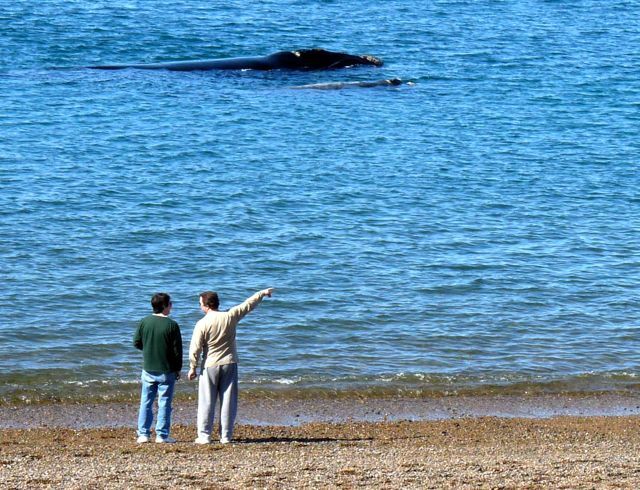 For the latest from the region, I recently exchanged emails with two friends, Silvina Garay of Say Hueque Travel in Buenos Aires and María Alicia Sacks of Puerto Madryn’s municipal Secretaría de Turismo. I translate their comments in the following paragraphs. WBB: Has the ashfall affected flights to Puerto Madryn and Trelew? 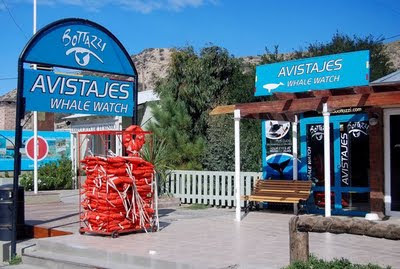 Silvina Garay: Yes, Puerto Madryn’s airport is very small and normally has only a few flights. 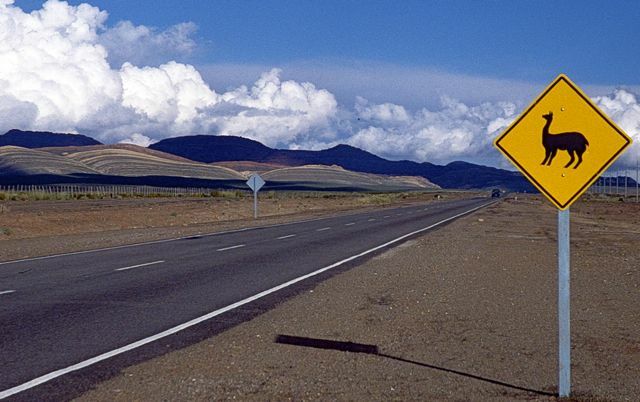 All the same Madryn, and the principal airport at Trelew, have had no flights for a month. Most of our clients have decided to take buses. María Alicia Sacks: The real problem is that suspended ash is keeping the flights from arriving. 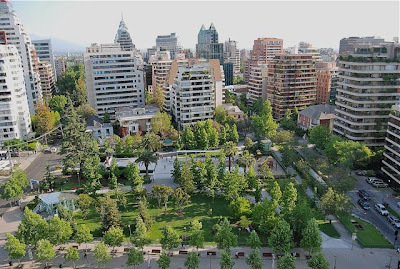 This is because of the ash plume that’s blowing over Patagonia and, depending on the wind, is reaching our coast, just as it’s affected Aeroparque [Buenos Aires’s domestic airport) and Ezeiza [the capital’s international airport]. WBB: Have you noticed any reduction in the numbers of foreign travelers because of the volcano, as they would usually travel by plane? SG: It’s really hard to measure because it’s low season here, when passenger numbers always decline. 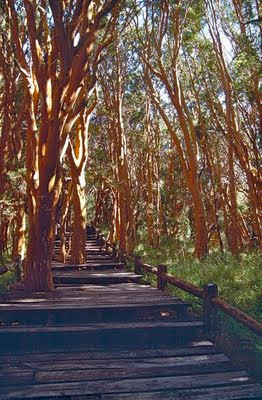 And we don’t work much with the Brazilian market, which is the biggest national market in winter. It’s true that most of our clients travel by plane, but we haven’t received any abnormal number of cancellations because of the ash. WBB: What about the whale-watching season at Península Valdés? Has demand for hotels and tours fallen because of the volcano? SG: I can’t say in detail. From our point of view [in Buenos Aires], it’s about the same as last year. MAS: All the services are operating fully. Just the other day we had a great whale-watching trip in Puerto Pirámides. WBB: Is there anything else worth mentioning? 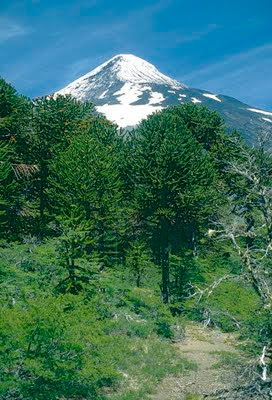 SG: I would re-emphasize that Península Valdés and Bariloche are both destinations with good long-distance bus service. Many of our clients who had to take the bus because the ash closed the airports were glad they did so. MAS: I can’t say exactly when the flights will start up again. It all depends on the ash. Clearly this has had an economic impact on us.